Negotiating the tricky details involved in creating a beautiful landscape around your home or business is best left in the hands of the experts. With many years of experience, The Green Goddess’ custom landscape team has turned ordinary outdoor spaces into eye-popping views. Creating the landscape dream you are looking for involves many facets. Our team will carefully design and layout that meets all of your needs. Due to the dry climate of the Phoenix area, the proper plants and trees are chosen to not only suit the climate, but the area they are intended for. They also take into consideration the soil that is being used. The design team will work with the eroding slopes and tree lines as well. They will work with the proper irrigation available and sun exposure. You will need to decide if your look is a custom 3-tier fountain, a stunning piece of metal art, a beautiful sculpture that helps accentuate your area or a colorful pot with native flowers; which will be that much needed focal point! Green Goddess also carries the finest selection of custom bar-b-ques in the desert. 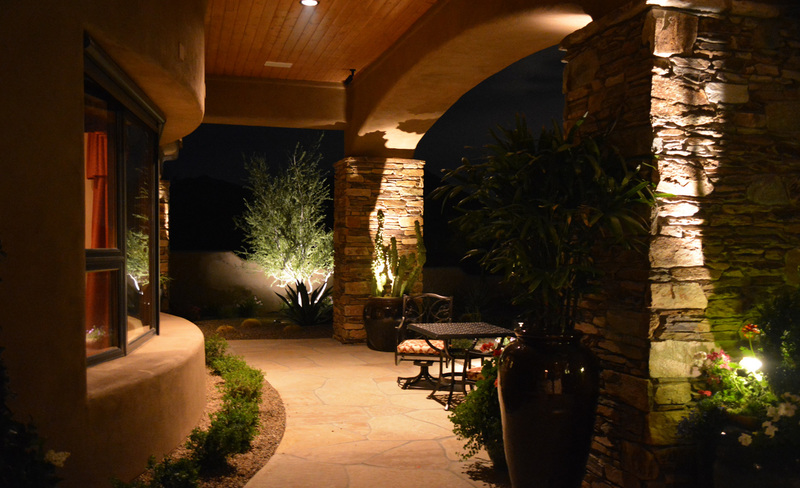 Installing custom lights throughout your yard brings the unique landscape we have created for you to “LIFE” at night! We also do indoor designs and can make the entrance of your business or any area of your home look warm and inviting. If doing your own landscape design is new to you, and options seem overwhelming, just consider the way you have setup rooms inside to help with ideas of your landscaping outside. Any landscape design should first consider sun patterns and irrigation placement, making sure plants and trees are placed appropriately. There are many books and TV programs that show how a custom design area should look. They have a tendency to show completed areas and overwhelming projects; go slow and think small. Landscaping design for beginners involves a lot of preparation. “Patience” is the key word. Accept the fact that change is going to happen and replacing various sections of your area with different plants or ground cover is inevitable. Your Green Goddess landscape specialist is always available to help with any of your gardening needs. With over 3 acres of plants, trees, shrubs, sculptures, fountains, pots and decorative metal art for your area, we make “Landscape for Beginners” much easier.